While it’s impossible to accurately predict how agriculture, climate, and even the land itself would change, a new AsapSCIENCE video tries to tackle that question. In the video, the narrator starts off by noting that a very small percentage of the human population is vegetarian. 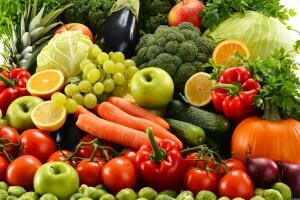 About 4 to 5 percent of all people in North America are vegetarian, while the number in India is higher, at 30 percent. To supply meat eaters with food, the livestock industry supports billions of farm animals, including cows, sheep, pigs, and chickens. We wouldn’t need so many cows or chickens if everyone stopped eating meat, though; their numbers would decrease, while also freeing up “vast quantities of land,” the narrator notes. Some 33 million kilometers of land are currently used to raise meat — about the size of Africa. And that’s not even including all the land required for growing vegetation used in animal feed. Livestock production also contributes to about 15 percent of all greenhouse gas emissions, which comes from feed processing and the enteric fermentation involved in raising animals, according to the Food and Agriculture Organization of the United Nations (FAO). In a vegetarian world, we would also preserve more water, since up to 70 percent of total water use goes to agriculture, with the majority of that going to livestock. In fact, 1 kilogram of beef requires five times more water per calorie than the same amount of fruit. 1. Have you ever considered becoming a vegetarian? What do you think about vegetarianism? 2. In recent years, there has been an increase in vegetarian dining options in Japan. What do you consider a healthy dining option? 3. There are a lot of meat eaters on the planet, and it takes a lot of land, water, vegetation, and animals to accommodate them. All this livestock production may have more of an environmental impact on the planet than anything else, especially when it comes to transportation emissions. That said, what would happen if the entire world stopped eating meat and went vegetarian? 567 What If We All Went Vegetarian?